Rinse and drain pulses several times. Place in a saucepan with 3 pints (7 cups) water. Bring to a boil. Skim off the scum that floats to the surface. Lightly toast the nigella, fenugreek, cumin and fennel seeds in a dry pan then grind to a powder and mix with the asafoetida, cayenne and turmeric. Add spice mix, grated ginger, 6 sliced garlic cloves, sliced green chillies, 2 sliced shallots and salt to pulses and simmer gently, partially covered, for 1 hour or until pulses are totally tender and starting to disintegrate. Stir occasionally to make sure it doesn’t stick and add more water during cooking if needed. The dal should be loose, not stodgy. Heat ghee in a frying pan. Add 2 sliced shallots and fry 2 mins. Add 2 sliced garlic cloves and fry another 2 mins til they start to turn golden. Add mustard seeds and dried chillies and fry another 2 mins. Keep stirring. By now the shallots and garlic should be a deep golden colour. Crush curry leaves in your hand and, standing back, add to frying pan. It will sizzle and spit. Stir a couple of times and then add contents of frying pan to the dal along with the fresh tomatoes. Immediately cover with the lid to trap the aromas. Let sit for five minutes, or up to 20. When time to serve, stir dal to incorporate curry leaves and add half the coriander leaves. Check seasoning and add more salt if needed. Garnish with remaining coriander. 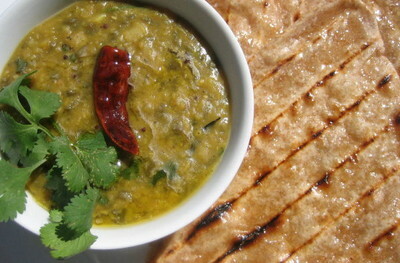 Serve with warm naan bread or chapatis, and yoghurt if you made it really spicy.